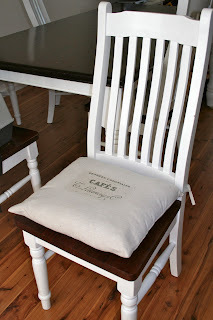 I loved the drop cloth cushions I made for my couch so much, I decided to make co ordinating chair cushions for our dining table. These are the red cushions we previous had. Making the new covers was so simple. I just folded the drop cloth in half, placed the cushion on top, and traced out the outline to the exact size, allowing a half inch seam for sewing. I made 6 of these. I also made 12 ties out of 1.5 inch x 10 inch strips of cloth. I sewed the two sides and front, turned them right side out, gave them a good iron. I then picked a cute french cafe label from The Graphics Fairy website, printed it in reverse on transfer paper, and ironed it on the cushions. 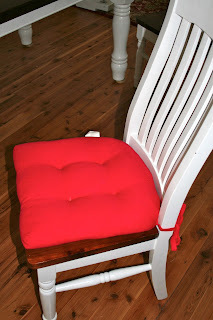 I then placed the red cushions inside. I pinned the back shut with the ties in place and sewed along the back, taking care to over sew the ties a couple of times to ensure they don't come off (like the old ones did). And tah-da, here is the finished product!